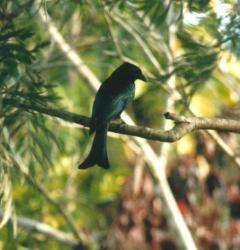 It is a large glossy black bird, with shiny red eyes and a 'fish' tail. It has several calls, including whistles and scissor like grating. Many individuals migrate to New Guinea in the winter and return to the lower altitude rainforest to breed in the summer.